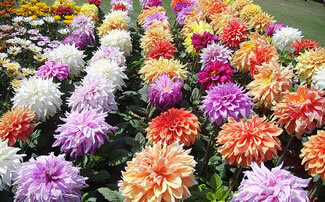 On the following pages at Dahlias.co.uk you will find plenty of information about the show stopping dahlia flower. With dahlias, you will be spoiled for choice as there is a mind boggling array of colours and shades to choose from that encompass whites to reds, pinks to dark purples and oranges to yellows. Dahlias exist in several forms with a selection of incredibly intricate flowers. Quite simply, this flower is a gift from nature that will have you hooked from the moment they start popping out of the ground. Happily you do not need the climate of Mexico to be able to successfully grow dahlias in the UK. Many have been cultivated to be hardy and resistant to colder climates. Many can be grown from seed although it is quite easy to obtain them as tubers. Being perennial, it means that dahlias will almost always blossom every year in the right conditions. Some varieties that have been grown from seed will more likely be annuals though, especially those that have been cultivated as bedding plants. As dahlias have a considerably lengthy growing and blooming season, they will naturally have an enduring appeal to gardeners of all abilities.